The New Maynard Gallery is the gallery space within the foyer of the Hawthorne Theatre at Campus West, Welwyn Garden City. This is a non-profit making charitable trust exhibiting both professional and amateur artists from across Hertfordshire. We are a group of enthusiastic volunteers and trustees who organise and hang exhibitions throughout the year. We are always looking for new people to join us to continue this work which is appreciated by the many visitors to Campus West. The Gallery aims to promote high quality art, support local artists and give pleasure and enjoyment to the community. 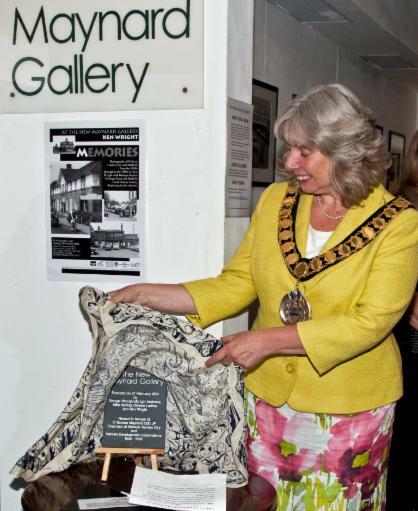 It is supported by Welwyn Hatfield Council which provides the gallery space. The gallery grew out of a request by local artist Sally-Ann Jones to display her work on the wall of the staircase at Campus West at the start of the new century. George Woodcraft, together with some other trustees of Digswell Arts Trust then approached Welwyn Hatfield Council to ask if more exhibitions could be held there. After some negotiation, the Council agreed to allow the Trust to use one wall, in the space where the bar and café now stand.Over the years the council has gradually allocated more and more wall space for use by the Gallery, and also boarded the walls to make them more suitable for hanging artworks. The New Maynard Gallery was officially founded on 21 February 2001. The first trustees who signed the constitution were chairman George Woodcraft together with Lyn Andrews, Mike Goring, Doreen Ludlow and Ken Wright, later joined by Norman Merry, Anne Woolmington and Sheila Woolf. The Gallery is named after C. Gordon Maynard, CBE, JP. He was Chair of both Digswell Arts Trust and the Maynard Gallery which existed at 22 Parkway in Welwyn Garden City from 1964-1977. 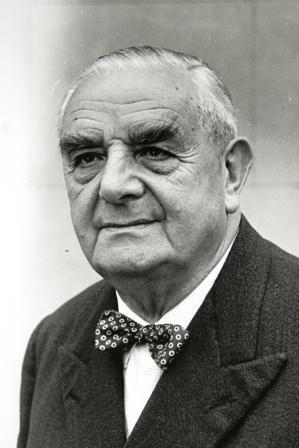 Gordon Maynard was also Chairman of Welwyn Garden City and Hatfield Development Corporations from 1958-1966. The Trust operates on a not-for-profit basis, and aims to support Hertfordshire artists and provide education by putting on exhibitions of art. The Gallery also has a community purpose by providing interesting displays of high quality art for the enjoyment of the thousands of people who use the cinema, theatre and other leisure facilities at Campus West each week. Typically there are nine exhibitions held each year, including one each for Welwyn Art Club, Welwyn Photographic Club and Herts Visual Arts. The New Maynard Gallery is open for viewing whenever Campus West is open, and entrance is free. For directions and opening hours see Visiting the Gallery. The Gallery is run by a Management Committee of Trustees, on a voluntary, unpaid basis. On the current Committee are: Roy Ward (Secretary), Val Kemp (Treasurer), Ken Wright, George Stodulski, Beata Horecka, Pat Joyce, Kat Clark and Trish Bugler. The best way to get in touch with Gallery Trustees is by email to info@newmaynardgallery.co.uk. The New Maynard Gallery welcomes applications to exhibit from local artists (especially of 3-D works), although there is a selection process and a waiting list. For more information see our Exhibit page or email artists@newmaynardgallery.co.uk.